When you jump on an escalator, the last thing that comes to mind is that you’ll be injured at the end of your short trip. For many of us, the same goes for using the elevator. Well, some people have some kind of fear of them, but most people consider them safe. Nevertheless, escalators and elevators can quickly turn your life into a nightmare if they are not in good working condition. Any malfunction in them can lead to personal injuries and deaths for the riders. 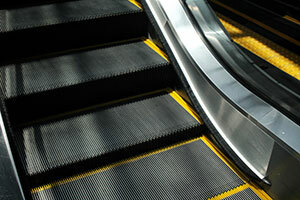 Problems appearing at escalators usually involve broken steps, broken or missing parts, too much space between parts, missing steps, and a failure to maintain. Elevators cause injuries and even deaths when the car suddenly drops due to malfunction, when the doors open earlier than needed and put riders at risk, in case of improperly conducted wiring and controls. When the person that manages or controls the escalator or elevator hires unqualified workers to inspect and maintain it, or they don’t maintain them at all, exposing good folks to many risks (life and health) and dangers. If you happen to be among them, call the best Miami elevator and escalator injury lawyer you can locate as soon as possible. You may be entitled to damages recovery for the harms and losses suffered due to the accident. Our Miami escalator and elevator accident lawyers at the Wolfson Law Firm are ready to help you. Call us now at 305-285-1115 for free consultations and let’s discuss your legal options. Miami is a major city in Florida and the United States. It is located on the paradise shores in South Florida, just south of Fort Lauderdale and West Palm Beach. It is one of the most popular tourist’s destinations in the country and the whole world. Tourists come primarily for sunbathing, but they are also attracted by the abundance of entertainment options there. Miami is home to many large shopping malls, retail stores, casinos, hotels, resorts, and other facilities that amaze with their grandeur. Elevators and escalators are often used there for convenient movement of visitors of the visitors. They really make things more simple, but when not maintained properly, they create inconveniences and danger - including personal injuries and wrongful deaths. According to the reports by the US Consumer Safety Product Commission (CSPC), more than 17,000 people in America get injured in escalator and elevator accidents every year, with around thirty of them resulting in fatal consequences. This number is significant and is not to be underestimated. These accidents sometimes lead to broken bones, brain injuries, concussions, and other severe injuries. If you happen to be injured in an elevator or escalator accident in Miami, you may be entitled to compensation for your medical bills, medication bills, medical devices bills, pain and suffering, loss of earnings, and other damages sustained as a result of the event. Do not hesitate to call our Miami escalator and elevator accident lawyers at the Wolfson Law Firm in case of a personal injury sustained on any of the escalators and elevators in Miami. We know that things don’t always go as planned and accidents happen. When they do, we help good folks recover for the damages that they may be entitled to receive. First and foremost, we advise you to turn down any offer from the liable person or their insurance company before speaking to a lawyer. Instead, call us for free consultations and figure out what your options are and how much you should get as compensation. If the offer is fair, we will tell you and you can go and accept it without any cost from us. If it isn’t, we can discuss your legal options and provide you with a plan to go forward. You can reach out to us at 305-285-1115. We don’t ask for fees unless we recover for you.